I met Germán Muñoz five years ago when he was promoting the wines of the “Ribera del Duero” denomination in the prestigious wine producing area of Castile and Leon. 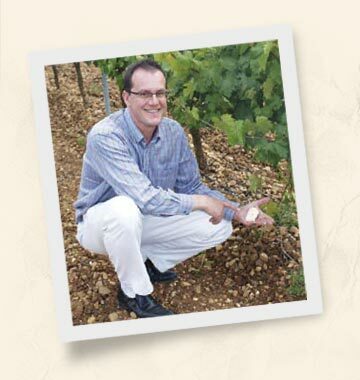 Germán has an impressive list of qualifications, including a degree in Agricultural Engineering, and a Master’s in Oenology, Viticulture and the Marketing of Wine. He also has a wealth of professional experience acquired in France, in Spain with the Pesquera Group, and with the European Commission in Brussels. Germán, a young man who is clearly passionate about terroirs, has just set up his own enterprise “Terroir 34”. Belgium has become a home from home for Germán. It was during his stay in Belgium that he first met his Belgian wife. They now have two adorable sons. Why 34? It is simply the Spanish country code used when telephoning from outside Spain. It also represents a return to his origins for this young man who was awarded a university prize for his Study of the Soils in the AOC of Rueda. He describes himself as a “consultant in wines and terroirs” and his attractive, eye-catching labels reflect his approach with the words: “In this project, I have selected the purest terroirs so that my wines can tell you their story”. Germán got together with some excellent growers and undertook to monitor their work and ensure a successful process from the vinification of their grapes to marketing. I met him again last June at a meeting of the Ribera del Duero Wine Association or “Confrérie”, for which he is the Ambassador, and we tasted his two first vintages. This wine is from the El Sotilo Domaine, the only quaternary terrrace (stony) terroir and, unusually, with the presence of limestone, which is what gives it its characteristic originality. His very first white wine is a huge success, a great example of what a well bred Rueda can be. It is from a carefully selected site. This Verdejo (100%) is shiny and bright, the colour of straw and with a glint of green. Its ample yet fine nose is a basket of citrus fruits (lemon, grapefruit), with exotic touches. As soon as it hits the mouth it seduces with its bouquet of aromas of pleasing white fruits and its freshness. Then, it displays a dense yet elegant mineral structure and a great long finish. This wine could easily have been poured into a carafe to enable us to appreciate it in all its complexity. An immediate winner! This wine is from the terroir of ‘La Horra’, from the Valdelayegua Domaine, near Peter Sisseck’s famous Pingus Domaine. These are lands belonging to one of the greatest families of vine growers in the region. The wine is made entirely from Tinto Fino (Tempranillo) grapes and has matured for 10 months in French barriques. Its colour is intense. The bouquet is distinct and open, with fine spices and little red fruits. The structure in the mouth is complex and balanced, dense but smooth, and it has a wonderfully fresh fruitiness. The tannins, which are present in tight little grains, are noble and perfectly integrated with the fruit and especially with its barely perceptible woodiness (a good sign!). The aftertaste is long but not excessive and the overall impression is above all harmonious.